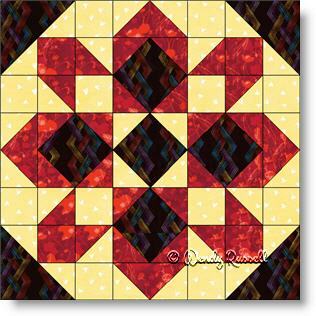 The Starglow quilt block is the perfect choice if you want to make a larger block rather than several smaller blocks. The quilt block itself does not contain over-sized pieces, as some larger blocks do. There are just more pieces in the block. But, the bonus is that you need to make fewer blocks for your quilt. This quilt block contains several different patches, so it is a good choice for practicing your skills. You will see half square triangles, flying geese units, and if you look closely you will also see the square in the square patches. This quilt block is the perfect one for using up your scraps as it makes a fantastic looking scrappy quilt -- simply by choose three different fabrics for each block. The instructions here are shown for one colouring, but as you can see on the extra page I have inserted, just by flipping these same three colours around, you can achieve a whole different look. All in all, it is a fun and interesting block to make.